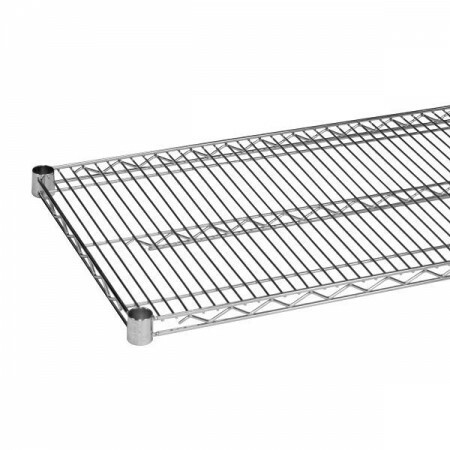 $44.99 Advance Tabco EG-2130 Green Epoxy Coated Wire Shelf 21" x 30"
$18.53 Winco VC-2130 Chrome Plated Wire Shelf 21" x 30"
$16.54 Winco VEX-2130 Epoxy Coated Wire Shelf 21" x 30"
Build your own storage space using the Thunder Group CMSV2130 Chrome Wire Shelving 21" x 30". Made from chrome-plated metal, this wire shelving is strong enough to hold heavy shelves without bending. Thanks to its vented design, these shelves allows for proper air circulation preventing dust accumulation. For added convenience, this wire shelving comes with plastic clips for easy set up.